The volume of information in the health care industry continues to grow exponentially. 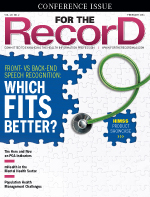 With meaningful use, ICD-10, mobile health, and telehealth all contributing to the data deluge, there is a strong need for health care organizations to develop an information governance (IG) framework to get control over this pool of rapidly growing and increasingly distributed information. Sounds easy—right? Health care organizations are required to manage their information on an enterprisewide basis, particularly as the landscape shifts to an accountable care framework in which access to information is required anywhere and at any time. To address these challenges, organizations must focus on the people, processes, policies, and technology that are required to support the shift to enterprisewide IG. By doing so, they can enhance their ability to obtain the business intelligence that can turn their information into insight. While this may seem intuitive, getting to the end state of enterprisewide IG is easier said than done. While today's reality may not offer a simple roadmap for organizations to follow, there are some proven, repeatable strategies that have been implemented across the provider landscape that help enhance the ability to achieve success. In order to gain the approval and resources required to successfully implement an IG initiative, it is critical to obtain buy-in from leadership. To help communicate the value of IG, look for stakeholders throughout your organization who have found benefit in past information improvement projects. These stakeholders, who can point to real-world results, can be champions for driving an IG initiative. • IG enables population health: Ensuring data quality and accuracy is a critical component in any IG initiative. To achieve quality objectives, it is critical to have a clean enterprise master patient index (EMPI) so that duplicate records are not impacting the ability to deliver effective care. At one health system, their business case demonstrated how resourcing the effort to clean up its EMPI enabled proper patient level attribution; because patients were correctly attributed to the correct primary care physicians, the organization could ensure physician panels were properly managed from a population health standpoint. • IG reduces labor expenses: A large provider was able to demonstrate that harnessing its information to simulate utilization patterns would enable it to better understand patient needs so it could manage staff appropriately. In turn, it was able to make informed, real-time decisions on appropriate labor and workforce management. For a provider organization in which more than 60% of operating expenses were attributed to labor, this initiative represented a significant savings opportunity. The ability to share and communicate IG value helps to solidify the business case that can be used to gain further IG organizational support. While conceptually, most health organizations understand the value of IG, for many this requires significant change. Many organizations overlook the importance of properly organizing for governance. This is a critical next step in getting the journey under way. Here, it is important to secure an executive sponsor—preferably someone within or close to the C-suite (eg, the CEO, chief operating officer, a trustee, or board member)—to get team members motivated for action. This role can also help to quickly manage roadblocks when they inevitably arise. Once an executive sponsor is identified, establish a multidisciplinary steering committee that will be involved in key decisions and functions. The committee requires broad representation across the organization, including from the CIO, clinical staff, IT, HIM, informatics, legal, finance, compliance, and risk. This steering committee will be the go-to cross-functional group charged with goal setting, approving and enforcing policies, allocating resources, and measuring results. Finally, assign working groups and staff. It is also important to spend sufficient time up front to ensure that the working groups have the necessary purpose, scope, and authority. If not, the organization may head down a path where the wrong team members are engaged. And it's important that team members believe they are on the journey together—all working in unison. If the oars of a boat aren't synchronized when rowing, the boat goes in circles, never getting closer to the destination. The steps above can help get an IG program off the ground, but it is also important to understand that, once started, IG can't be a "set it and forget it" initiative. Continuously solicit input from stakeholders and make adjustments to reflect the current organizational goals. By assessing and reassessing an IG program at regular intervals, an organization can continue to demonstrate the value of its program, helping to garner support for future projects. And so the journey continues. — Nancy Twombly, a senior solution marketing manager at Iron Mountain, is responsible for the go-to market activities for the portfolio of health care solutions.